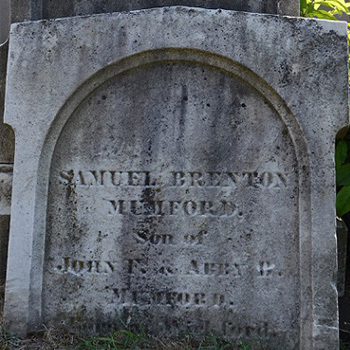 Samuel Brenton Mumford was born to Abigail Brenton and John Fry Mumford, in 1791. He married Louisa Dexter in 1818; the ceremony was performed by Rev. Stephen Gano, pastor of the First Baptist Church in Providence. Samuel’s profession is listed in the 1820 census as “engaged in commerce.” But by 1826, he had formed Samuel B. Mumford & Co., commercial merchants. His offices were located first on Main Street, and later on South Water Street, in Providence. 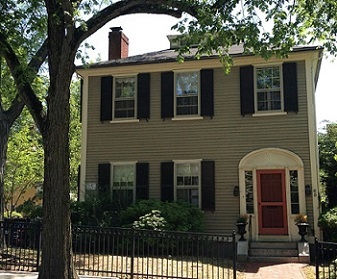 In 1823, Samuel purchased a lot at 66 College Street for $720, and built a house there in about 1825. 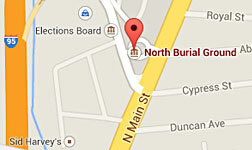 He and his family would live there until 1844, when they moved to North Providence. Mumford was apparently very successful in his business endeavors. He became a director of the Merchants National Bank in 1828 and was one of the 1,009 original owners of the Providence Athenaeum, purchasing share #36 in 1836 for a $100 gift toward the building fund. Mumford’s house, now at 65 Prospect St., Providence. His wife, Louisa, was also active in the community. The 1826 city directory lists her as Treasurer of the Baptist Female Charitable Society. He was distinguished by great industry, uprightness and business talent. He was a man of observation and action, not words. Under the covering of retired manners, and a habit which led him, unaffectedly, to shrink from notice, he employed an uncommon talent for observing others. . . . He was one of a class of public men, who are public without being so distinguished or named; whose practical talent is consulted by all classes, and who, while they never occupy a prominent position in society . . . are yet respected by all in the community. . . . I can testify to the great good sense which marked his judgments regarding subjects familiar to his mind; to his sympathy for the afflicted; to the faithfulness of his friendships; and to his kindness and benevolence towards his friends and relatives. . . .
Mumford’s College Street house was later occupied by “weird fiction” author H.P. Lovecraft, who lived in its upper level rooms from 1933 to his death in 1937. In 1959 the house was moved to 65 Prospect Street (where it still stands) to make way for Brown University’s List Art Center. Granger, James N. An address delivered at the funeral of Samuel B. Mumford, in the meeting-house of the First Baptist Church in Providence, March 3, 1849. Providence: H.H. Brown, 1849. The Providence Preservation Society. Mary A. Gowdey Library of House Histories.